What machines do a variety of coffees? Thread: What machines do a variety of coffees? I've been looking at the Behmor Brazen Plus Coffee Brewer. But what would I need to spend on a machine that does a variety of different coffees, like flat whites and cappuccinos etc.? Are there any good machines below the $500 mark? Or am I dreaming? Yes there are, but it’s such an open question that it’s hard to answer. Give us a bit more info in what you’re looking for so we can answer your question properly. Are you looking for an auto machine that can do a variety of drinks with just the push of a button or would you be happy with a home espresso machine that requires a bit of work to learn how to use it, and also to maintain it properly? Do you only want a new machine or is second hand ok? All coffees start with an espresso shot. How you texture the milk will define a particular drink, float white, laté, cappuccino etc. A cheap machine, as long as it can produce a reasonable espresso shot and can steam milk, can give you a large variety of coffee's. The most important thing is the quality of the coffee it produces. If the auto machine takes pod coffees I'd have to say "no". But if the auto machine can take proper ground coffee I'll consider it. But I would consider buying a machine that took a bit of work to maintain properly if it produced a good coffee at an a affordable price. I guess I'd prefer brand new, if possible. Is this possible to do with the Behmor Brazen Plus Coffee Brewer? Maybe with some attachment of some extra gizmo on the side? I'm showing my lack of knowledge here. The Behmor Brazen is a batch drip filter brew. Of course you can add milk to the coffee you make with it, but this isn’t really what it’s designed for. How much are you looking to spend? And what result are you trying to get? Do you want to end up with a cafe style latte/flat white? That sort of sounds like what you’re after. no, this is misleading. all *espresso-based* coffees start with an espresso shot. an espresso shot is a serve of very strong coffee (10% coffee solids) that can be diluted with milk or water. it is produced by forcing hot water through a compressed puck of finely-ground coffee at high pressure (~9bar). the behmor brazen is designed to brew filter coffee, which drips hot water over coarsely-ground coffee, and will give you a cup with about 1.4% coffee solids, similar to tea in mouthfeel. In truth, I probably would be happy with just a batch drip filter brew. It just so happens I showed a picture of the Behmor Brazen Plus Coffee Brewer to this barista type guy and he just commented that it looked like it couldn't do other coffees. If you read the OP, the question refers to flat whites, cappuccinos etc. These are espresso based drinks, so I am not actually misleading anyone! OP is asking about the Brazen. OP is clearly confused about different types of coffee. Making an ‘all coffee’ statement serves to prolong this confusion. OK then how about we try to educate the OP! There are espresso machines available under the $500.00 mark, Breville, Sunbeam, DeLoghi are just a couple of manufactures who make entry level machines. You can also steam milk with these machines. But you will need to also factor in the price of a grinder as well, again Breville and Sunbeam come to mind. 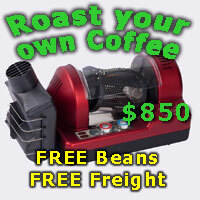 You should be able to get an entry level machine / grinder combo for around the $500.00 or less. With these machines you should be able to make acceptable flat whites, Cappuccinos, etc. The Behmor makes a different style of coffee, more of the pour-over, drip, Aeropress style coffee, which you would not use steamed milk (not usually). But the taste of the coffee, if done correctly will taste very good, the coffee produced from the Behmor will actually (if you drink it black) seem to change flavour as it cools. This is not a bad thing as I have an Aeropress and I enjoy the coffee black from it from hot all the way to cold! What ever you decide to choose, you will be starting an enjoyable coffee journey, which all of us here on the forum enjoy. Also, which way you decide, you must try to use the fresh coffee beans, STAY AWAY FROM SUPERMARKET COFFEE BEANS !!! Javaphile and pamount like this.